The Dirck Gulick House, located at 506 Rt. 601 across from Dutchtown-Harlingen Road, opened in May 2004 as the headquarters and library of the Van Harlingen Historical Society. Our library is open on the last Saturday of each month (except December through February) from 10am-noon. 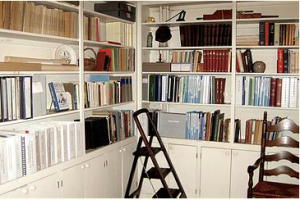 The library contains local history, books, old photographs, journals, and other local history resources. The Genealogy section contains material on prominent local families by the names of Dorland, Stryker, Cruser/Croesen, Staats, Skillman, Baird, Blaw, Quick, Terhune, Rynearson, Durling, Pardee, Beekman, Campbell, Voorhees, VanderVeer, and Hoagland. We also have posession of Greenwood’s Researcher’s Guide to American Genealogy, Nelson’s New Jersey Marriage Records, 2 volumes of Genealogies of New Jersey Families, and 4 volumes of Genealogical and Memorial History of the State of New Jersey. In addition to monographs, there are files on individuals with deeds and other papers. Contact info@vanharlingen.org for more information.